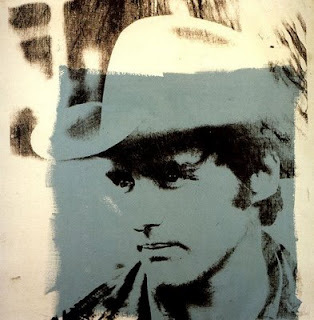 Within the space of a month or so during the summer of 1969, moviegoers got to see Dennis Hopper as a luckless outlaw who dies while reluctantly aiding John Wayne in True Grit – and a chopper-riding rebel journeying across America alongside Peter Fonda in Easy Rider . And, mind you, that disparate combo of credits only begins to hint at the variety and versatility that define the resume of the late, great actor, who finally lost his long battle with prostate cancer Saturday at age 74. You can read my 1990 interview with Hopper here, my Houston Culture Map obituary here -- and an essay about Easy Rider I wrote just last April here. And if you would like to see him near the start of a career that spanned six decades, here is Hopper in the 1958 pilot episode -- scripted by Sam Peckinpah! -- of The Rifleman . The Empire Strikes Back -- From 1950! In 3-D!